Holy Redeemer Parish was established in mid-1983 to serve the small but growing Catholic population of Palm City. Initially there were only 77 families in the faith community; but by the fall of 1991, the number had grown to over 1,000. From the completion of the multi-purpose Parish Center in December, 1984, until 1992, that building served the spiritual needs of the congregation and housed the educational, administrative and social activities of the entire parish. Ground-breaking for Holy Redeemer Church took place on April 8, 1992. The church was essentially completed in December, 1992, and the first Mass celebrated in the new church was the Children’s Mass at 5 p.m. on Christmas Eve. 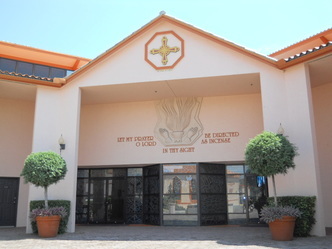 Completion of final details took place during the first quarter of 1993, and the official dedication by the Bishop of the Diocese of Palm Beach, occurred on Palm Sunday, April 4, 1993. The outdoor courtyard provides a gathering place for parishioners. ​The central fountain features a statue of the Holy Family. The garden area features a statue of the Blessed Mother surrounded by beautiful blooming plants. A bench provides a welcome place to sit and meditate. ​The interior of the church is about 14,000 square feet and seats nearly 1,000. The church has a choir area and rooms for activities associated with various liturgical ministries. There is also a separate chapel devoted to Our Lady of Perpetual Help. 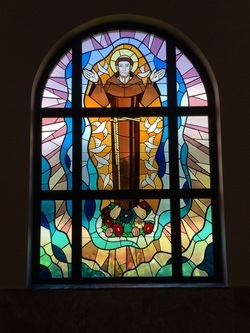 The entrance to the church includes the Baptismal Font – the Fountain of the Living Water - and stained glass panels featuring scenes from Sacred Scripture. This entire area is intended to portray entry into Christian life via the Sacrament of Baptism and to serve as a reminder to those entering the church thus providing a sense of Baptismal renewal as they come to worship God. The overall theme is the importance of water to our life, temporal and spiritual, and there are scenes from both the Old and New Testaments. The left-door side panels feature passages from Genesis - God is shown hovering over the water and the Great Flood is depicted. The right-door side panels feature passages from Exodus - Moses is opening the Red Sea and striking the rock in the desert. The three large center panels portray a scene from the New Testament – The Baptism of Christ by John in the Jordan River. ​The inscription, “Fountain of Living Water,” refers to Christ and also to the Baptismal font. The focal point of the church’s interior is a marble altar platform 70 feet in width and raised six steps from the floor of the church. In the center sits a massive marble altar table, simply decorated with a cross and the alpha and omega. On the left side is an ambo that is massive and imposing, thus fitting for proclamation of the word of God. On the right side is the Shrine of the Blessed Sacrament which exudes both power and dignity. The 16 tons of marble for the altar area is from Puebla, Mexico. It was selected and quarried by Ing. Jose Galvan and Raymundo Guaneli. Galvan is one of the outstanding marble artists in all of Mexico, and together these two craftsmen have done nearly all the marble work for the principal government office buildings in Mexico City. Framing the altar platform are two large stained-glass windows, one depicting the Instrument of Redemption – the Crucifixion of Christ – and the other symbolically representing the Church of the Sacraments. Due to their massive size, each of these windows is divided into 30 individual panels. Blues and whites are used to depict flowing water in order to blend the individual panels together. The use of water in this way also ties these main windows to the church entrance. 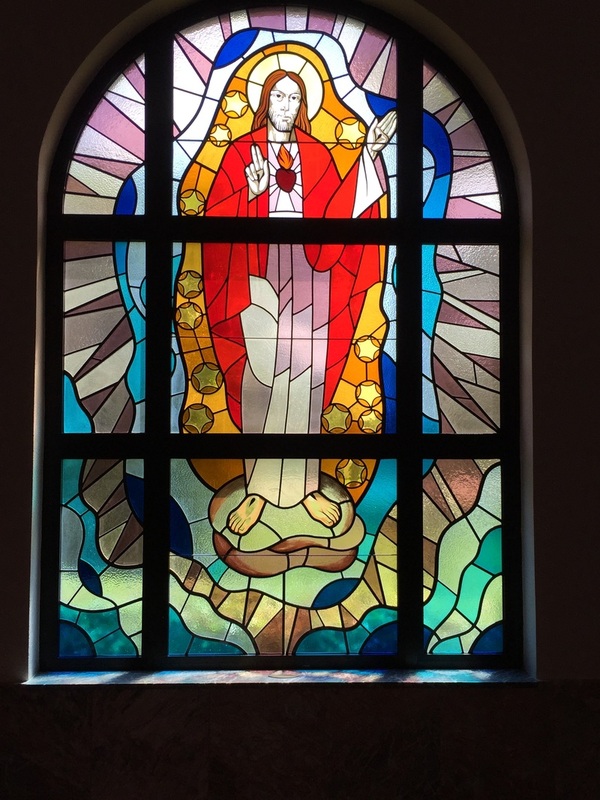 At the bottom of the window of the Redemption is a rounded shape representing the world with the tree of life and the cause of original sin indicated by the snake, thus depicting the need for our Redemption. The symbolism has been kept simple so as not to crowd the window. The humble birth of Christ is represented by the crib and the Star of Bethlehem. His passion is depicted by the crown of thorns surrounding the chalice. Next we see the tools of the Crucifixion and the items that fulfill the prophecies regarding our Lord’s death. In the center, the Blood of the Lamb is being shed, the source of our Redemption. Lastly, the Glorious Cross, the instrument of our Redemption, is at the top. At the bottom, the Church of Christ is depicted as a boat struggling in the Sea of Life. The rounded shape is again used here for symmetry, thus tying these two main windows together. The Church is being guided through the Sea of Life by grace from the Sacraments. The Sacrament of Baptism is represented by a shell pouring water and by the lighted candle used in that ceremony. Confirmation is depicted by the Holy Spirit descending as a dove and the seven flames showing the Seven Gifts of the Spirit. Reconciliation is in the center panel in the form of two keys, the keys to our salvation, and an olive branch for the peace that flows from reconciliation with God. The Sacrament of Extreme Unction, also known as the Sacrament of the Sick, is represented by a vase for the holy oils used in the Sacrament and, again, a lighted candle. Matrimony is depicted by two joined rings in the Sea of Life shown by the water underneath. In the center, the Eucharist which feeds us and through the Church brings us to salvation, is represented by the chalice and host and as wheat and grapes from which our spiritual food and drink come. To the left of the Eucharist is the symbol of priesthood – Holy Orders. Every symbol has a cross in the background representing our Christian heritage. At the very top we have the Chi Rho – Christ himself – the symbol of our Lord. In the outside walls of the church are five smaller stained glass windows. All are at eye level and contain considerable detail. In order to achieve balance and interesting composition, all include the same flowing lines and movement of water found in the two large windows. The Sacred Heart of Jesus is surrounded by stars representing the promises of the Sacred Heart to St. Margaret Mary. Our Lady of the Immaculate Conception is surrounded by the 12 stars from the Apocalypse. 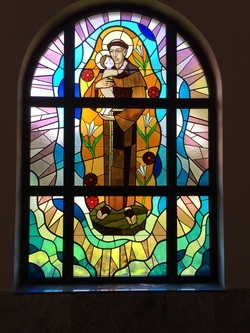 St. Anthony of Padua is shown holding the infant Jesus and surrounded by lilies, symbols of purity. St. Francis of Assisi is surrounded by birds and flowers appropriate for such a lover of nature. 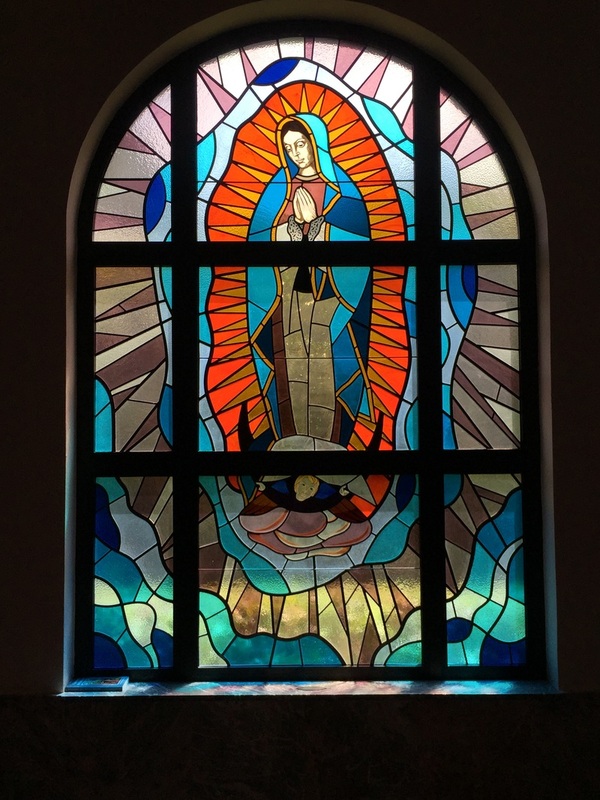 Our Lady of Guadalupe is the Patroness of the Americas and most fitting for inclusion with the other saints depicted. the Holy Redeemer. Christ is shown in an uplifting manner, bursting from the earth. The Resurrection, Ascension and Redemption are all reflected in a victorious Christ. The Risen Christ is a 10-foot tall, hand-carved sculpture made from linden wood ​which is naturally homogeneous and free of knots. ​This statue was hand carved by Ivo Demetz, an Italian sculptor and friend of Gheradi, who also carved the statues of the Blessed Mother, St. Joseph and the Stations of the Cross. In the rear of the church is the Chapel of our Lady of Perpetual Help which is available through a separate entrance so that it can be open when the main church is not in use. The chapel contains a mosaic of the Madonna which is a reproduction of a 14th or 15th century Greek portrait that has resided in the Church of St. Alphonsus Liguori in Rome since 1866. It is displayed in a regal way and framed by two archangels. At the top are the Greek initials for “Mother of God.” To the left are initials for “St. Michael the Archangel,” and he is depicted holding the lance and spear with the vessel of vinegar and gall of Christ’s Passion. To the right are initials for “St. Gabriel the Archangel” and he holds the cross and nails. Next to the Child are the initials for “Jesus Christ.” The mosaic is enthroned in a frame of Puebla marble which is massive and angled to provide depth to the frame itself. To embellish the wall around the shrine, stars and floating lines have been used. These also provide contrast with the severe lines of the frame, thus complementing the mosaic rather than overwhelming it, and permit the entire wall to be treated as a unit. On each side of the shrine there is a stained glass window. In both windows, symbols are used to depict the event. The one to the left is the Annunciation. A large lily represents the Blessed Virgin, and the Holy Spirit hovers over her as a dove. A set of wings represents the archangel Gabriel who was God’s messenger of the Annunciation. The window to the right depicts the Assumption of the Blessed Virgin. There are two sets of angel wings which, according to scripture or dogma, carried the Virgin’s body up to Heaven, and the wings are surrounded by stars to give an idea of Heaven. On the top is the Blessed Mother in symbolic form. This image of Our Lady was given to a poor Aztec Indian convert named Juan Diego in 1531. One day as Juan was walking to the chapel through the hill country in central Mexico, he encountered a beautiful woman surrounded by a ball of light as bright as the sun. 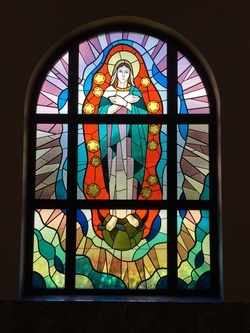 Speaking in his native tongue, she identified herself as "the ever-virgin Mary, Mother of the true God who gives life and maintains its existence." She told Juan Diego "I desire a church in this place where your people may experience my compassion. All those who sincerely ask my help in their work and in their sorrows will know my Mother's Heart in this place. Here I will see their tears; I will console them and they will be at peace. So run now to Tenochtitlan and tell the Bishop all that you have seen and heard." Juan Diego followed Mary's instructions and went to the palace of the Bishop-elect Fray Juan de Zumarraga and requested an urgent meeting. After being made to wait several hours, the bishop-elect told Juan that he would consider the request of the Lady. Juan felt that he was not effective in persuading the bishop, so he returned to the hill to implore Mary to send someone else to the bishop. However, she responded "My little son, there are many I could send. But you are the one I have chosen." Upon Mary's request, Juan returned to the bishop. After waiting several more hours, the bishop told him to ask the Lady to provide a sign as proof of who she was. Juan dutifully returned to the hill and relayed the message to Mary, who was again waiting for him there. Mary told Juan to return the following day, however Juan did not return until two days later as he had to care for his very sick uncle. As Juan was passing the hill in search of a priest for his dying uncle, he found Mary waiting for him. She spoke "Do not be distressed, my littlest son. Am I not here with you who am your Mother? Are you not under my shadow and protection? Your uncle will not die at this time. There is no reason for you to engage a priest, for his health is restored at this moment. He is quite well. Go to the top of the hill and cut the flowers that are growing there. Bring them then to me." While it was freezing on the hillside, Juan obeyed Mary's instructions and went to the top of the hill where he found a full bloom of Castilian roses. Removing his tilma, a poncho-like cape made of cactus fiber, he cut the roses and carried them back to Mary. She rearranged the roses and told him "My little son, this is the sign I am sending to the Bishop. Tell him that with this sign I request his greatest efforts to complete the church I desire in this place. Show these flowers to no one else but the Bishop. You are my trusted ambassador. This time the Bishop will believe all you tell him." Juan returned to the palace and told the bishop his story. Then he opened the tilma letting the flowers fall out. But it wasn't the beautiful roses that caused the bishop and his advisors to fall to their knees; for there, on the tilma, was a picture of the Blessed Virgin Mary precisely as Juan had described her. The next day, Juan took the bishop to the spot where he first met Mary. He then returned to his village where he met his uncle who was completely cured. Within six years of this apparition, six million Aztecs had converted to Catholicism. The tilma shows Mary as the God-bearer - pregnant with her Divine Son. Since the time the tilma was first impressed with a picture of the Mother of God, it has been subject to a variety of environmental hazards including smoke from fires and candles, water from floods and torrential downpours and, in 1921, a bomb which was planted by anti-clerical forces on an altar under it. A cast-iron cross next to the tilma was twisted out of shape and the marble altar rail was heavily damaged, yet the tilma was untouched. ​In 1977, the tilma was examined using infrared photography and digital enhancement techniques. Unlike paintings, the tilma shows no sketching or any sign of outline drawn to permit an artist to produce a painting. Further, the very method used to create the image is still unknown. The image is inexplicable in its longevity and method of production. It can be seen today in a large cathedral in Mexico City. It is, by far, the most popular religious pilgrimage site in the Western Hemisphere. In Catholic churches and homes, one of the most popular images of Jesus is the image of the Sacred Heart of Jesus. It is the image of God’s love revealed in the pierced heart of His Son. It is the symbol of a love that conquers sin and transcends death, the symbol of the One who loved us to the end. The heart is crowned with thorns to symbolize Jesus' crowning as King of the Jews. It is topped by a cross to symbolize the Death of Jesus and that He reigns as King on the Cross and in righteous souls. It is engulfed in flames to symbolize the burning Love and Mercy of Jesus which clamors to be spent. ​It is pierced to symbolize the piercing of Jesus as He hung dead on the Cross from which gushed forth the Precious Blood and Water as a Font of Mercy for poor sinners. Love has always been associated with the heart, so it was only natural that the love of God became represented by a heart, the heart of his Son Jesus. In him, God the Father revealed his infinite love for us. On the Friday after the Solemnity of Corpus Christi, the Church celebrates the Solemnity of the Sacred Heart of Jesus. Very soon after dedication of the church, work was begun on a new Administration Center. This building is across from the church and provides space for the clergy and staff and for various volunteer ministries. The second floor houses nine classroom/meeting rooms. With the completion of the church and administration building, the original multi-purpose Parish Center adjacent to the church is now used exclusively for the faith community’s many social activities.